The last few days fairly dry weather has been the trend over most of Tamil Nadu except for some extremely isolated rains in South Tamil Nadu in the absence of any significant synoptic conditions. But the saving grace has been the absence of any abnormally hot temperature trends across South India. Many parts of Northwest India is possibly seeing early summer like conditions with abnormally hot day time conditions with places like Delhi seeing more than 5 degrees above normal max temperature. Similar trend is likely to continue for Northern India plains as possibly a quick transition from spring to summer could happen. 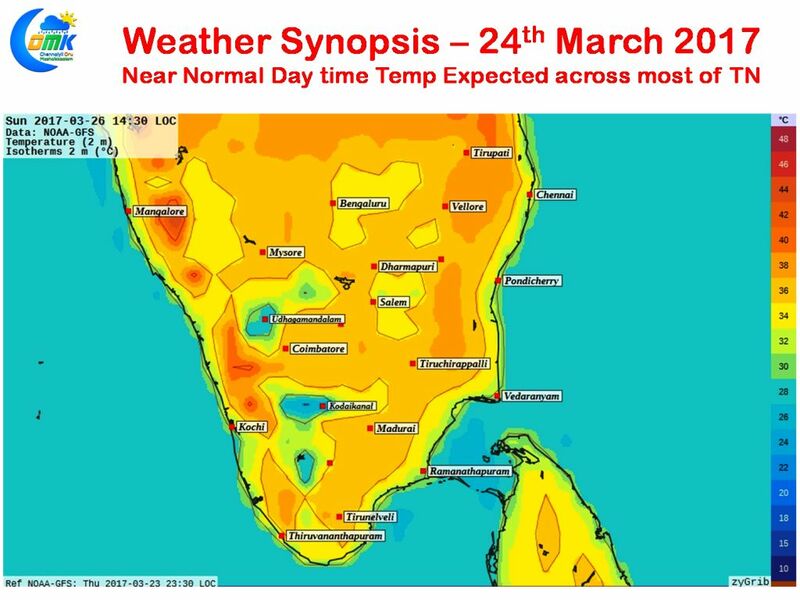 Tamil Nadu though is likely to stay closer to normal in terms of day time maximum temperature for the next few days with the interior places seeing temperatures in the region of around 37°C with one or two places crossing 38°C in the North interior TN districts like Vellore and possibly in one or two places around Trichy district. North Coastal areas like Chennai could see temperatures in the region of 33 / 34°C making it a OK day in terms of comfort factor. As keen weather watchers would observe the last couple of nights have been slightly cooler than the previous weeks indicating the dryness in the atmosphere. Numerical models indicate similar conditions to continue until early next week at least with most parts of Tamil Nadu seeing slightly cooler than normal early mornings compared to this time of the year making it a pleasant prospect to go for a morning jog or a cycling activity.